Inspector Sands had me at “crustacean version of Waiting for Godot“. Theatre for kids that takes Beckett as a reference point arouses curiosity if nothing else. In Rock Pool, Vladimir and Estragon are swapped for Crab and Prawn, two shellfish (almost) out of water. A storm has swept them from their separate homes in the ocean and into the small, evaporating rock pool of the title, where they are stranded in wait for another wave to rescue them. Until then, they are stuck together. This set-up prepares the ground for classic odd couple comedy, as Crab and Prawn adapt to their new environment and one another. 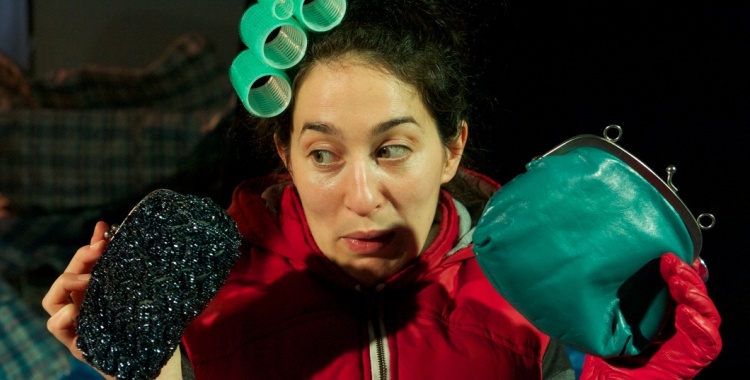 The two performers make a charismatic double act: Giulia Innocenti brash, headstrong and petulant as Crab, while Lucinka Eisler’s nervy Prawn is an altogether more sensible – and occasionally exasperated – presence. Squabbling looks as though as it might turn serious when a ravenous Crab takes knife and fork to her new frenemy, but ultimately (and happily) this is a piece about overcoming differences rather than gobbling them up. There might be lots of hanging around, but fortunately it’s far from an interminable wait. The momentum sags in a few sequences, including an overlong lullaby during which the room grows visibly restless, but for the most part Inspector Sands carry their young audience along with them. Music plays a key role, as do the company’s limited but cleverly deployed props. There are even some fishy puns (“The Prawn Identity”, anyone?) to entertain the adults, while a scene involving ever-shrinking handbags is a sublime little slice of surreal comedy. The show also offers, thanks to its soothing voiceover, just a hint of the children’s nature documentary. I’m reminded a little of The Adventures of Alvin Sputnik, which takes the looming issue of climate change as its backdrop rather than its substance. In this ridiculously charming family show from Perth Theatre Company and Weeping Spoon Productions, the future flooding of the planet is never explicitly addressed, but simply by adopting this as its premise the show refuses to present kids with an airbrushed version of the world we live in – and the catastrophe it might be hurtling towards. Here, the natural world is very much a canvas, but somewhere in the background of the piece lurks a light reminder of the delicate ecosystem supported by our oceans. Mostly, however, the emphasis of Rock Pool is on friendship, fun and mischief. Play is even built into the production’s simple DIY aesthetic, which suggests the sort of basic make-believe that children are adept at. A red cycling helmet and barbecue tongs stand in for Crab’s shell and claws, while Prawn gets a simple raincoat. Why bother with realistic costumes when we’re here to use our imaginations? The gleefully splashy conclusion, too, embraces playfulness with grinning abandon. It’s just a shame that between the gentle pre-show interaction and the joyfully inclusive ending, the involvement of the young audience feels uneven and a little under-thought.